Building of Charterhouse School, one of the oldest schools of UK. A school is an educational institution designed to provide learning spaces and learning environments for the teaching of students (or "pupils") under the direction of teachers. Most countries have systems of formal education, which is commonly compulsory. In these systems, students progress through a series of schools. The names for these schools vary by country (discussed in the Regional section below) but generally include primary school for young children and secondary school for teenagers who have completed primary education. An institution where higher education is taught, is commonly called a university college or university, but these higher education institutions are usually not compulsory. In addition to these core schools, students in a given country may also attend schools before and after primary and secondary education. Kindergarten or pre-school provide some schooling to very young children (typically ages 3–5). University, vocational school, college or seminary may be available after secondary school. A school may be dedicated to one particular field, such as a school of economics or a school of dance. Alternative schools may provide nontraditional curriculum and methods. There are also non-government schools, called private schools. Private schools  may be required when the government does not supply adequate, or special education. Other private schools can also be religious, such as Christian schools, madrasa, hawzas (Shi'a schools), yeshivas (Jewish schools), and others; or schools that have a higher standard of education or seek to foster other personal achievements. Schools for adults include institutions of corporate training, military education and training and business schools. In home schooling and online schools, teaching and learning take place outside a traditional school building. Schools are commonly organized in several different organizational models, including departmental, small learning communities, academies, integrated, and schools-within-a-school. 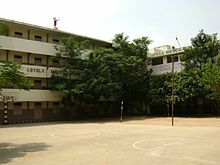 Loyola School, Chennai, India – run by the Catholic Diocese of Madras. Christian missionaries played a pivotal role in establishing modern schools in India. In the United Kingdom, the term school refers primarily to pre-university institutions, and these can, for the most part, be divided into pre-schools or nursery schools, primary schools (sometimes further divided into infant school and junior school), and secondary schools. Various types of secondary schools in England and Wales include grammar schools, comprehensives, secondary moderns, and city academies. In Scotland, while they may have different names, there is only one type of secondary school, although they may be funded either by the state or independently funded. School performance in Scotland is monitored by Her Majesty's Inspectorate of Education. Ofsted reports on performance in England and Estyn reports on performance in Wales. Under the British rule in India, Christian missionaries from England, USA and other countries established missionary and boarding schools throughout the country. Later as these schools gained in popularity, more were started and some gained prestige. These schools marked the beginning of modern schooling in India and the syllabus and calendar they followed became the benchmark for schools in modern India. Today most of the schools follow the missionary school model in terms of tutoring, subject / syllabus, governance etc.with minor changes. Schools in India range from schools with large campuses with thousands of students and hefty fees to schools where children are taught under a tree with a small / no campus and are totally free of cost. There are various boards of schools in India, namely Central Board for Secondary Education (CBSE), Council for the Indian School Certificate Examinations (CISCE), Madrasa Boards of various states, Matriculation Boards of various states, State Boards of various boards, Anglo Indian Board, and so on. 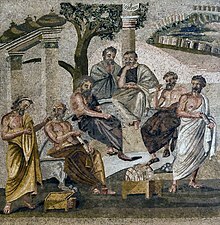 The typical syllabus today includes Language(s), Mathematics, Science – Physics, Chemistry, Biology, Geography, History, General Knowledge, Information Technology / Computer Science etc.. Extra curricular activities include physical education / sports and cultural activities like music, choreography, painting, theater / drama etc. 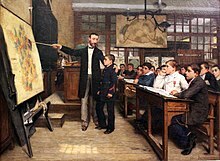 Albert Bettannier's 1887 painting La Tache noire depicts a child being taught about the "lost" province of Alsace-Lorraine in the aftermath of the Franco-Prussian War – an example of how European schools were often used in order to inoculate Nationalism in their pupils. In much of continental Europe, the term school usually applies to primary education, with primary schools that last between four and nine years, depending on the country. It also applies to secondary education, with secondary schools often divided between Gymnasiums and vocational schools, which again depending on country and type of school educate students for between three and six years. In Germany students graduating from Grundschule are not allowed to directly progress into a vocational school, but are supposed to proceed to one of Germany's general education schools such as Gesamtschule, Hauptschule, Realschule or Gymnasium. When they leave that school, which usually happens at age 15–19 they are allowed to proceed to a vocational school. The term school is rarely used for tertiary education, except for some upper or high schools (German: Hochschule), which describe colleges and universities. 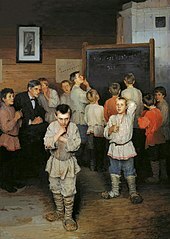 In Eastern Europe modern schools (after World War II), of both primary and secondary educations, often are combined, while secondary education might be split into accomplished or not. The schools are classified as middle schools of general education and for the technical purposes include "degrees" of the education they provide out of three available: the first – primary, the second – unaccomplished secondary, and the third – accomplished secondary. Usually the first two degrees of education (eight years) are always included, while the last one (two years) gives option for the students to pursue vocational or specialized educations. In Western Africa, the term school can refer to “bush” schools, Quranic schools, or apprenticeships. These schools include formal and informal learning. Bush schools are training camps that pass down cultural skills, traditions, and knowledge to their students. Bush schools are semi similar to traditional western schools because they are separated from the larger community. These schools are located in forests outside of the towns and villages, and the space used is solely for these schools. Once the students have arrived in the forest, they are not allowed to leave until their training is complete. Visitors are absolutely prohibited from these areas. Instead of being separated by age, Bush schools are separated by gender. Women and girls are not allowed to enter the territory of the boys’ bush school and vice versa. Boys receive training in cultural crafts, fighting, hunting, and community laws among other subjects. Girls are trained in their own version of the boys’ bush school. They practice domestic affairs such as cooking, childcare, as well as how to be a good wife. Their training is focused on how to be a proper woman by societal standards. Qur’anic schools are the principle way of teaching the Quran and knowledge of the Islamic faith. These schools also fostered literacy and writing during the time of colonization. Today, the emphasis is on the different levels of reading, memorizing, and reciting the Quran. Attending a Qur’anic school is how children become recognized members of the Islamic faith. Children often attend state schools and a Qur’anic school. In Mozambique, specifically, there are two kinds of Qur’anic schools. They are the tariqa based and the Wahhabi based schools. What makes these schools different is who controls them. Tariqa schools are controlled at the local level while the Wahhabi are controlled by the Islamic Council. Within the Qur’anic school system, there are levels of education. They range from a basic level of understanding, called chuo and kioni in local languages, to the most advanced which is called ilimu. 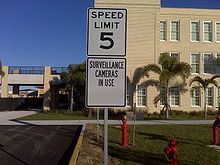 To curtail violence, some schools have added CCTV surveillance cameras. This is especially common in schools with gang activity or violence. Other security concerns faced by schools include bomb threats, gangs, and vandalism. The convenience of learning at home has been a major attractive point for enrolling online. Students can attend class anywhere a computer can go – at home, a library or while traveling internationally. Online school classes are designed to fit your needs, while allowing you to continue working and tending to your other obligations. Online school education is divided into three subcategories: Online Elementary School, Online Middle School, Online High school. As a profession, teaching has levels of work-related stress (WRS) that are among the highest of any profession in some countries, such as the United Kingdom and the United States. The degree of this problem is becoming increasingly recognized and support systems are being put into place. According to a 2008 mental health study by the Associated Press and mtvU, eight in 10 college students[where?] said they had sometimes or frequently experienced stress in their daily lives. This was an increase of 20% from a survey five years previously. 34 percent had felt depressed at some point in the past three months, 13 percent had been diagnosed with a mental health condition such as an anxiety disorder or depression, and 9 percent had seriously considered suicide. Schools and their teachers have always been under pressure – for instance, pressure to cover the curriculum, to perform well in comparison to other schools, and to avoid the stigma of being "soft" or "spoiling" toward students. Forms of discipline, such as control over when students may speak, and normalized behaviour, such as raising a hand to speak, are imposed in the name of greater efficiency. Practitioners of critical pedagogy maintain that such disciplinary measures have no positive effect on student learning. Indeed, some argue that disciplinary practices detract from learning, saying that they undermine students' individual dignity and sense of self-worth – the latter occupying a more primary role in students' hierarchy of needs. ^ Bentley, Jerry H. (2006). Traditions & Encounters a Global Perspective on the Past. New York: McGraw-Hill. p. 331. ^ "Leseferdighet og skolevesen 1740–1830" (PDF). Open Digital Archive. Retrieved 2014-05-15. ^ Watkins Hanna, Mark (May 1943). "The West African "Bush" School". American Journal of Sociology. 48: 666–675. ^ Watkins Hanna, Mark (May 1943). "The West African "Bush" Schools". American Journal of Sociology. 48: 666–675. ^ Bonate, Liazat (2016). Islamic Education in Africa. Indiana University Press. ^ Winsa, Patti (16 November 2012). "Skateboard academy, dude? Alternative schools gathering considers four new concepts". Toronto Star. Retrieved 31 May 2013. ^ Great Atlantic and Pacific School Conspiracy (Group) (1972). Doing your own school: a practical guide to starting and operating a community school. Beacon Press. ISBN 978-0-8070-3172-8. Retrieved 30 May 2013. ^ 13 October 2010, Amanda Marrazzo, Chicago Tribune, Nature's classroom: Eco-friendly schoolyards a space for teaching everything from poetry to nutrition, Accessed 16 June 2014, "...schoolyards are perfect settings for composting, learning about insects...."
^ 9 March 2011, School Garden Weekly, Asphalt to Ecosystems: Design Ideas for Schoolyard Transformation, Accessed 16 June 2014, "..Danks takes readers on a tour of successful green schoolyards..."
^ "School Vandalism Takes Its Toll". Wrensolutions.com. Archived from the original on 6 December 2009. Retrieved 2009-10-03. ^ "Online Education Offers Access and Affordability". Usnews.com. Retrieved 2015-05-17. ^ "Work-Related Stress in teaching". Wrsrecovery.com. Retrieved 2009-10-03. ^ "Teacher Stress, Burnout and NCLB: The U.S. Educational Ecosystem and the Adaptation of Teachers" (PDF). Retrieved 18 December 2012. ^ "Teacher Support for England & Wales". Teachersupport.info. Retrieved 2009-10-03. ^ "Teacher Support for Scotland". Teachersupport.info. Retrieved 2009-10-03. ^ "Survey confirms student stress, but next step is unclear (May 06, 2005)". Paloaltoonline.com. 2005-05-06. Retrieved 2009-10-03. ^ "Children & School Anxiety, Stress Management". Webmd.com. Retrieved 2010-03-28. Nakosteen, M. (1964). ‘History of Islamic origins of Western Education AD 800–1350’, University of Colorado Press, Boulder.